But is that really the case? What is behind the increase in driving–and do the last few months of data really signal a return to a period of increasing driving? 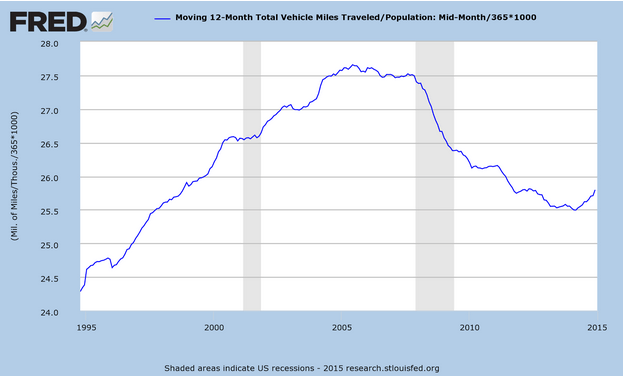 It’s very clear what’s behind the surge in VMT. The big news of the energy market last year was the collapse in oil prices. Oil that had averaged roughly $100 a barrel for more than five years suddenly dropped to less than $50, taking gasoline prices down with it. According to the Energy Information Administration, the average price of a gallon of regular gas fell from $3.26 in January 2014, to $1.99 in February 2015. The data for the last calendar year show that the rebound in driving roughly corresponds to the last quarter of the year–the time when gas prices dropped the most. The blue line shows the price of a gallon of gas in dollars, by week, and the orange line shows the percentage change in vehicle miles traveled compared to the same month one year earlier. It would be extremely surprising if the lower price of gasoline didn’t prompt Americans to drive more. It’s quite clear that the run up in gas prices since 2004 was a major factor in reducing the amount of automobile travel. Academic studies suggest that the short-run elasticity (price responsiveness) of driving is about -0.1 to -0.2, meaning that a 10 percent increase (decrease) in fuel prices will result in a 1-2 percent decrease (increase) in miles driven. As our colleague Clark Williams-Derry at the Sightline Institute has pointed out, the increase in driving is about what you’d expect given the historic relationship of gas prices and driving. The increase in driving is likely to lead to more traffic congestion and more crashes–externalities of automobile use that have been easing in recent years. Lower gas prices also influence vehicle purchasing patterns. Sales of light trucks increased about 3.6 percent, year-over-year from December 2012 to December 2013. Truck sales accelerated briskly in 2014, recording a 12.4% increase between December 2013 to December 2014, to a total of more than 9 million light trucks. The net effect was to slow the rate of improvement in the average fuel economy of newly purchased cars. The University of Michigan computes the sales-weighted average fuel economy of newly purchased cars on a monthly basis. Over the past seven years, Americans have been purchasing progressively more fuel efficient vehicles–average fuel economy of newly purchased cars has increased from 20.8 miles per gallon in model year 2007 to 25.3 miles per gallon last year. In the last quarter of 2014, the year-over-year rate of improvement in vehicle fuel efficiency declined sharply. For the first three quarters of the year, new cars sold in each month averaged about 0.7 more miles per gallon than cars sold in the same month in 2013. For the last quarter of 2014 (when gas prices were dropping precipitously) the fuel economy of new cars averaged only about 0.3 more miles per gallon that cars sold in the same month in the previous year. There’s a lot of emphasis put on the raw mileage number–3 trillion miles–but a better way of thinking about whether we’re driving more or less as individuals is to adjust these gross mileage numbers by population. Nearly half of the 1.7 percent increase in miles driven is due simply to having more people. Adjusted for population, the increase isn’t an impressive, about 0.9%. Per capita driving is still well below its 2005 peak– we’re driving about as much as we did in 1998. You can see the underlying data for this chart here. The big question going forward is whether this uptick is the harbinger of a reversal in the decade-long decline in driving, or whether it’s just a temporary blip. The evidence so far is simply too fragmentary to draw hard conclusions. But the recent rebound in gas prices–up 18% to $2.36 per gallon, according to the Energy Information Administration– may mean that the boost to driving that was provided by cheap gas is already ebbing.